Pai Lum is a family style. Students are encouraged to treat each other as brothers and sisters, and to take care of each other in and out of class. This means that we do not fight each other in tournaments or bouts - although in training we do everything we can to improve ourselves and each other! 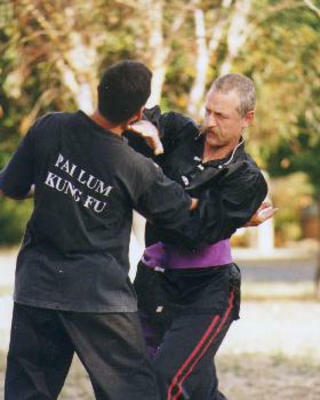 Pai Lum is a long range style, and uses a variety of punching and kicking techniques. This does not mean, however, that we neglect close range blocks and strikes: they are of great importance and use, together with chin na, or grappling techniques. Students are taught the more spectacular spinning and jumping kicks, but you will need to remember that they are not always the best techniques! If you are not very flexible at the moment, don't worry - your flexibility will improve with training, and while high kicks may look great, the same kick at a lower level is often much more effective. < What is the White Dragon?